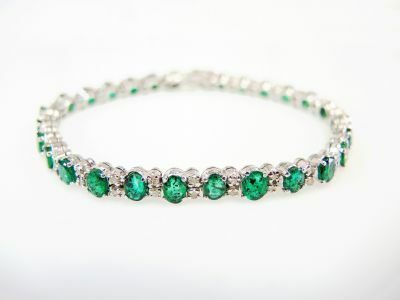 A beautiful vintage 10kt white gold bracelet with 28 oval facetted cut deep green emeralds, est. 5.42ct and 56 round brilliant cut diamonds, est. 0.84ct (clarity:SI-I1 & J-K colour). It is 6.25 inches (16.50cm) in length.